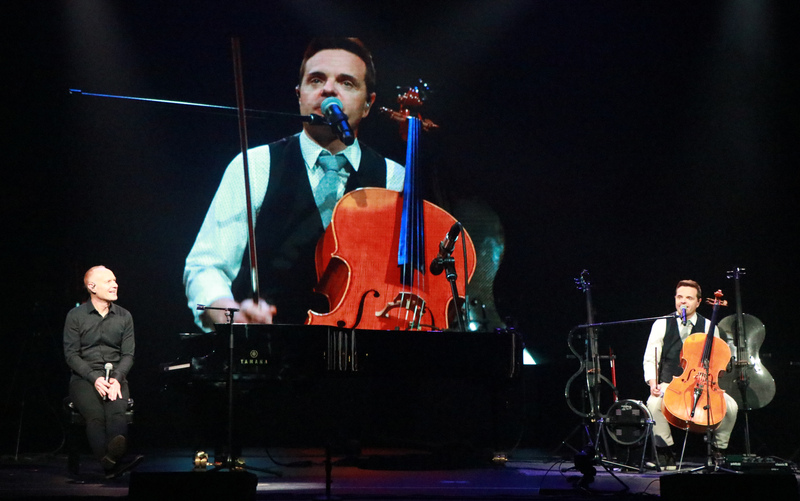 CEDAR CITY — With a repertoire ranging from the silly to the sublime, The Piano Guys enthralled an appreciative Cedar City audience Thursday night. 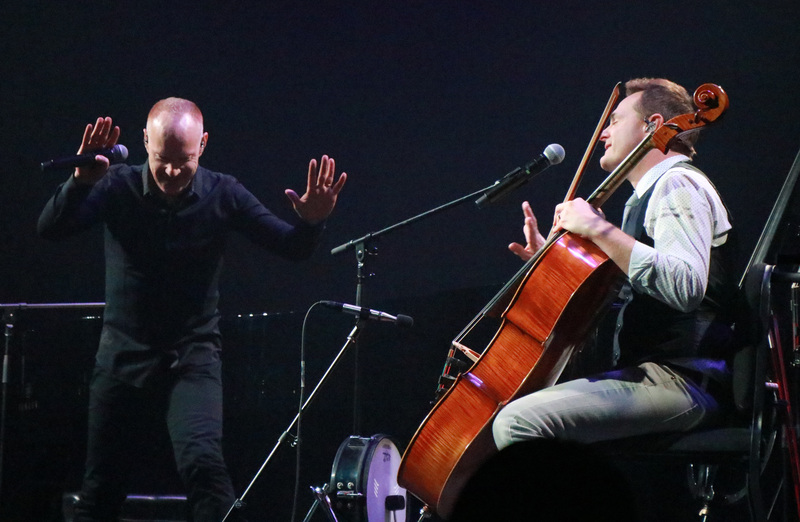 Performing an eclectic mix of classical and modern favorites, pianist Jon Schmidt and cellist Steven Sharp Nelson took the sold-out crowd at the America First Event Center on a winding musical journey spanning centuries and continents. Fellow band members Al van der Beek and Paul Anderson joined in for a few of the numbers, including an encore finale. Throughout the two-hour show, the self-described group of “dorky dads” showcased their love for music and how to have fun making it. Nelson jokingly told the crowd the group’s name is a bit of a misnomer, since he plays the cello rather than the piano. But he explained The Piano Guys was actually the name of Anderson’s piano store in St. George, for which the group’s initial videos were designed to help advertise. Now, several years and millions of YouTube and social media followers later, “We still haven’t sold a piano,” Nelson joked. Several of the group’s popular videos provided the backdrop for their live concert pieces, momentarily transporting the audience to places like the Great Wall of China, Iguazu Falls in Brazil, and the forests of Scotland. Another stunning video was filmed atop a cliff in the red rocks of Southern Utah. In between numbers, the clever repartee between Schmidt and Nelson provided not only comic relief, but insights as to what inspired the pieces they were playing. One particularly memorable sequence had Nelson humorously pretending to doze off while playing the same eight notes over and over again. At another point, Schmidt danced manically onstage until being reined in by Nelson’s comically stern reproach. One poignant moment happened when Nelson and Schmidt called up a teenage girl named Kiarra out of the audience. Kiarra, who lost her left hand in an accident last year, joined Schmidt at the piano bench, appearing slightly nervous but smiling. After being shown what notes and melodies to play by the masterful Schmidt, Kiarra caught on quickly and was soon capably tickling the ivories during a lively jam session. She received a standing ovation at the end of her performance. They also recreated their popular video featuring their 1770s alter-egos playing Bach on screen as they mashed that up with a hit from two centuries later, the Jackson 5’s “I Got You Back/Bach,” with Nelson employing a “talk box” device attached to his cello. “It captures that shag carpet vibe of the 70’s,” he joked. As the evening wound to a close, they played “A Thousand Years,” followed by an equally haunting rendition of “Amazing Grace,” with bagpipers joining in. “Thank you for putting us on this stage tonight,” Nelson added, as the audience clapped and cheered. The group received a well-deserved standing ovation at the end of the performance. Ed Note: This article has been updated for clarification.